Joseph Edward "Joe" Nichols (born November 26, 1976) is an American country music artist. Nichols was born and grew up in Rogers, Arkansas. His father played in a local country music band. As a teenager he played in a rock band and was also a disc jockey. He signed with Intersound Records in 1996 and released his first album the same year. He didn't have his first hit record until 2002, however. In 2003 Nichols was named "Top New Male Vocalist" by the Academy of Country Music. He also received two Grammy Award nominations and a third in 2004. 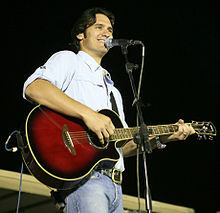 Wikimedia Commons has media related to Joe Nichols. ↑ 1.0 1.1 1.2 Steve Huey. "Joe Nichols Biography". AllMusic. Retrieved 3 February 2015. ↑ "The 38th Annual Academy Of Country Music Awards". CBS Interactive Inc. Retrieved 3 February 2015. This page was last changed on 4 June 2017, at 22:10.